So where did we leave off? Oh yes, things were a-happenin’. 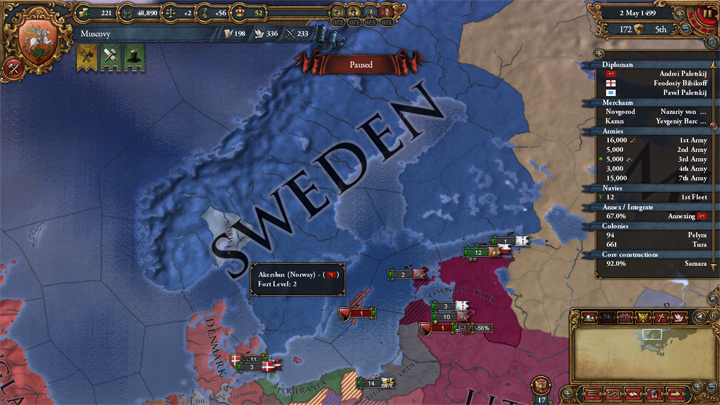 1500 is drawing closer and I’m still worried about the growing Swedish threat. They’ve rivaled me even though I’ve done nothing but be the most cordial neighbor. Maybe if I keep our relations high enough (and ally myself with the growing Poland) they’ll leave me alone. (And now “Who Can it Be Now?” by Men at Work is in my head). 1494 and we have our first colony! It’s got the Arctic modifier, so it grows slower than normal, but still–look at it! It’s so cute. Muscovy is a proud papa. (Or mama, I dunno.) 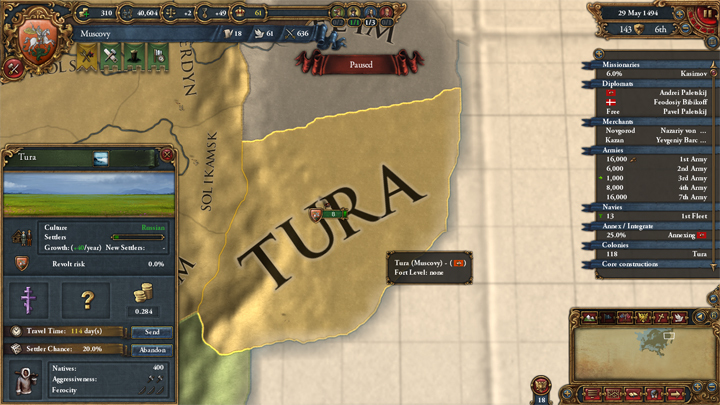 I also fought a war against the Golden Horde and the Uzbeks, claiming some more territory. I don’t have the missionary strength to convert anything once the provinces are cored, but I’ll worry about that later. Tragedy strikes in 1501. My king dies with an infant for an heir. 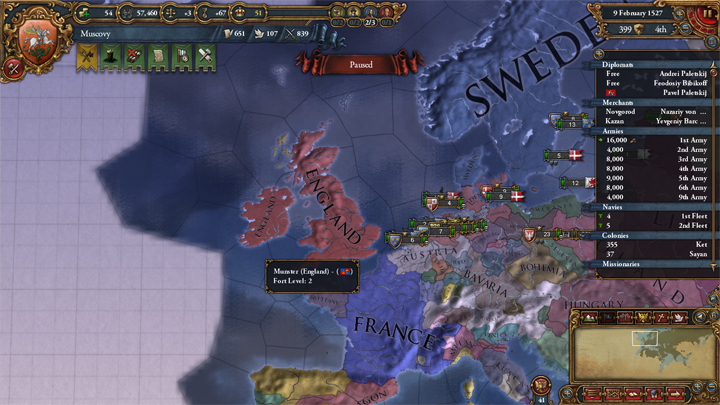 I’m stuck with a Regency Council for another 5+ years, but that’s Europa Universalis IV for ya. I can’t declare war, so I spend my time building provincial improvements, coring my newest additions, and starting another colony. I figure I can colonize eastward all through Siberia and then move south into the Manchu, Ming, Uzbek, etc. lands. Seriously, the Regency Council is the worst. My Monach Points are gathering at an appallingly slow rate, so technology advances are few and far between. I hire some level 2 advisors to help things along. 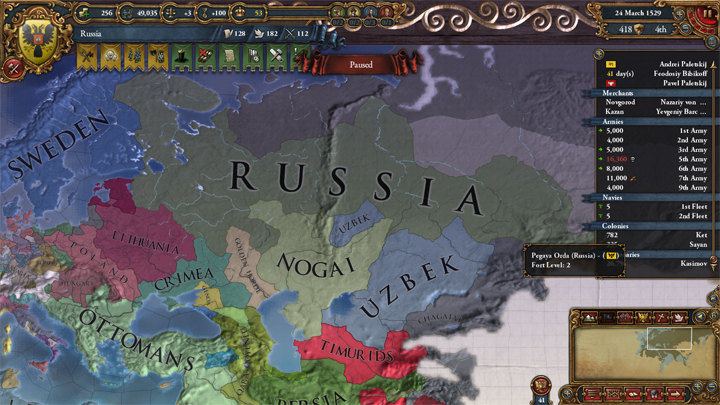 I need to get to Admin Tech level 10 so I can form Russia. A New King! To war! 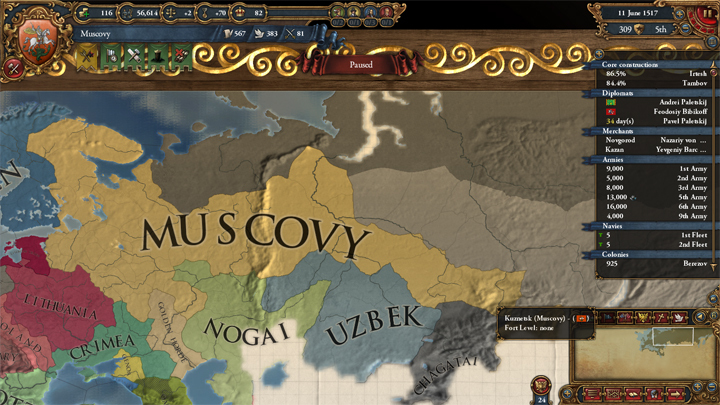 1506 and Muscovy’s king has finally come of age. First thing I do? I declare war on the Uzbeks again. By 1510 I’m the owner of some brand new provinces and another new colony. I’m slowly making my way east across Siberia toward the Pacific Ocean. Rather than sitting around for a few years, I decide to take advantage of the fact that I have a treaty with the Uzbeks and attack the Golden Horde. Everything goes well (this seems to be a running theme). However by 1513, I need to take a break from the warfare, let my manpower recover, and build more province improvements. I spent most of the teens and early 20s (1520s that is) peacefully expanding and building my economy. I’m debating going to war with the Uzbeks for some more territory when Poland calls me into a war against the Teutonic Order (who are allied with the Livonian Order). Reval, Ösel, and Livland are looking pretty, pretty juicy to me. With them flying the Russian flag, I’ll have more trade power in my home node and, of course, more territory. Well, with my westward ambitions stymied for the moment, the Uzbeks are back in my sights. But none of that matters. 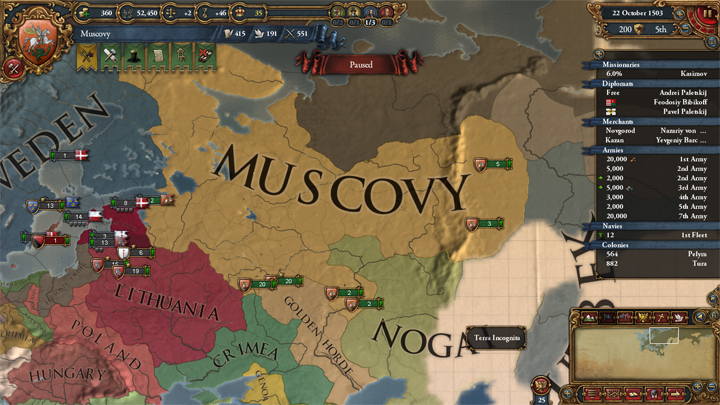 The only thing that matters to the world is this: I’ve transformed Muscovy into Russia. Gone is that kinda ugly yellow color and instead my country is the evergreen… green, I guess of Russia. It’s beautiful to behold. But what to do now that I’m Russia? Obviously I’ll keep expanding eastward; Manchu might feel the might of the Russian armies soon. I’ll also need to choose a new Idea Group now that I hit Admin Tech level 10. Do I go military and take Defensive or Offensive Ideas? Or maybe Religious Ideas; that’ll be useful for fighting in Southeast Asia.